Pressure Group “Standing for Women” ran a poster quoting the Google Dictionary definition of the word “woman” on a billboard site in Liverpool during Labour Party Conference this week. 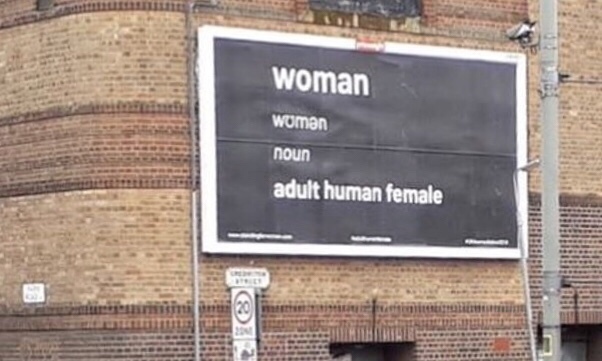 The poster carries the headline “Woman, women, noun, adult human female” in white copy on a plain black background. The poster intended to encourage attendees of the Conference – which included Jeremy Corbyn, all of the mainstream British media and hundreds of Labour Party members – to oppose any expansion of the legal definition of what it is to be a woman to include biological males who self-define as female. The government is currently consulting on the issue and it has caused a dispute between some groups of feminist campaigners and those who argue for improving human rights for people of transgender. The issue is one that inspires passion on both sides, hence a poster that is as simple as one can be – and cost only £700 to run – caused a significant stir. One Labour activist who felt particularly aggrieved tweeted Primesight – the outdoor media owner of the site in question – calling the group “transphobic” and the poster of hate speech. Primesight acted speedily by tweeting a response which said that “the posters will be removed from our billboards as soon as possible” and then pledged their support for the LQBT community and “equality for all”. The problem with the Primesight statement is that by intervening in an ongoing government consultation on one side of the debate by curtailing the freedom of speech of the other, is not an act which proves your commitment to equality for all. Primesight should have referred those who were complaining to the ASA and allowed the advertising regulator to make the call. Whilst the ASA doesn’t regulate political ads where the principle function is to influence voters in local, regional, national or international elections or referendums, its regulatory remit does include other advertisements with political subject matter. If a group runs an ad to raise awareness about a cause or idea which is political in intent, but does not seek to influence a vote, the ASA is within its remit to investigate and adjudicate on it. This is more evidence that there is widespread confusion as to what laws govern political advertising. If both a political activist and an advertising media owner don’t know who can say what – and how to complain – then the average voter is going to be clueless and therefore powerless. The whole system needs reform. More on that here.